The Greek Orthodox Church of Cyprus is one of the autocephalous churches of the Orthodox Christian communion whose territory consists of the island of Cyprus in the Mediterranean Sea. Although through the centuries the island has been occupied by various parties, the church has retained its independence. The current primate is Archbishop Chrysostomos II of Nea Justiniana and All Cyprus. Christianity was originally brought to Cyprus by the Apostles Barnabas and Mark in the first century, c. 46AD and was under the jurisdiction of the Patriarchate of Jerusalem until 325. Apostle Barnabas is considered to be the first bishop of Cyprus. 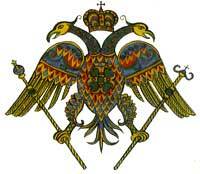 Its autocephaly was established at the Council of Ephesus in 431, overriding the claims of the Patriarch of Antioch. In 478, the grave of St. Barnabas was found, with a copy of the Gospel of Matthew on his relics. The autocephaly of the Church of Cyprus was confirmed later that year by the Roman Emperor Zeno who granted its Archbishop "three privileges," that is: to sign his name in cinnabar, to wear purple instead of black under his vestments, and to use an imperial scepter instead of the episcopal crosier. The Arab invasions of the seventh century forced the Archbishop to flee the island to Hellespont, where under the protection of Emperor Justinian II he established a new city called Nova Justiniana (now "Nea Justiniana") in honor of the emperor. In 698, the Arabs were driven out of Cyprus and the Archbishop returned to the island, but retained the title of Archbishop of Nova Justiniana and All Cyprus. With the occupation of Cyprus by the Crusades from 1191 to 1571, the Orthodox hierarchy found itself subordinated to the occupying Latin French and Venetian kings, who forced a reduction in the number of Orthodox bishops from 14 to four. Additionally, the Latin bishops attempted to gain concessions on the differences in doctrine and practices between the two churches. The occupation of Cyprus by the Ottomans from 1571 to 1832, resulted in return of privileges to the Orthodox which they had previously had, but in an environment that was insecure, and under which their lives and property were always at the disposal of the Ottomans. Under the Ottoman ruling practices, the Christian populace of Cyprus (Rum millet) was considered a separate nation with the Orthodox church the only legal Christian church. They considered the Archbishop to be the political head of this Christian nation, with responsibility for collecting taxes. The news of the revolution for Greek independence in 1821 resulted in the death of Archbishop Kyprian and many other members of the Cyprian Orthodox hierarchy, clergy, and laity. In 1878, after the British assumed control of Cyprus, the Church gained more freedom in her religious practices, including a return to the use of the bells in the churches. Yet the British interfered seriously in church activities, resulting in an uprising by the Church in October 1931, after which the British imposed additional restrictions on election of the Archbishop. The British occupation lasted until 1960 when Cyprus regained its independence with the election of Archbishop Makarios as the head of state of Cyprus as well as being the head of the Church. This unique combination continued until his death in 1977. As a consequence of an attempted military coup in 1974, Turkey invaded and occupied about a third of the island, forming an independent government, with almost all Orthodox moving to the remaining Greek portion of the island. Since then within the Turkish occupied part of the island, Orthodox property has sustained substantial damage. The Turkish occupied territories contain 514 churches, chapels, and monasteries. His Beatitude the Archbishop of Cyprus Chrysostomos II, seat Nicosia. His Grace Christoforos, Bishop of Karpasia. His Grace Porfyrios, Bishop of Neapolis. Most Reverend Georgios, Metropolitan of Paphos, seat Paphos. His Grace Nektarios, Bishop of Arsinoi. Most Reverend Chrysostomos, Metropolitan of Kition, seat Larnaca. Most Reverend Pavlos, Metropolitan of Kyreneia, seat Kyreneia. Due to the Turkish occupation of Keryneia, the Holy Bishopric of Keryneia, since 1974, is temporarily located in Lefkosia. Most Reverend Athanasios, Metropolitan of Limassol, seat Limassol. His Grace Nikolaos, Bishop of Amathus. Most Reverend Neophytos, Metropolitan of Morphou, seat Morphou. Due to the Turkish occupation of Morfou, the Holy Bishopric of Morfou is temporarily located at Evrychou village. Most Reverend Vasilios, Metropolitan of Konstantia-Ammochostos, seat Ammochostos. Due to the Turkish occupation of Ammochostos (Famagusta) the Holy Bishopric of Kostantia is temporarily located in Paralimni. Most Reverend Nikiforos, Metropolitan of Kykkos and Tylliria, seat Kykkos Monastery. Holy Monastery of Kykkos, Troodos. Most Reverend Isaias, Metropolitan of Tamasos and Orinis, seat Deftera. Most Reverend Varnavas, Metropolitan of Tremithus, seat Idalion. Abbot: Most Reverend Nikiforos, Metropolitan of Kykkos and Tylliria. Abbot: Right Reverend Epiphanios, Bishop of Ledra. Abbot: Right Reverend Leondios, Bishop of Chytroi. Abbot: Very Reverend Archimandrite Gabriel. See List of Archbishops of Cyprus. 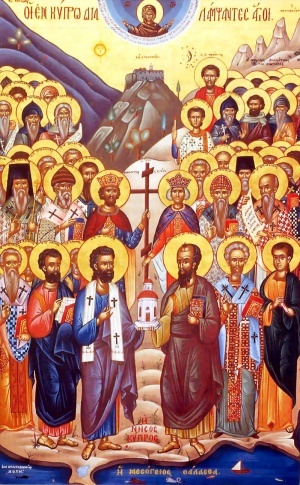 The official website for the Church of Cyprus lists approximately sixty local saints. The most famous of these is Apostle Barnabas (June 11) and Lazarus. The * designates a church whose autocephaly or autonomy is not universally recognized. Annemarie Weyl Carr. Byzantines and Italians on Cyprus: Images from Art. Dumbarton Oaks Papers. Vol.49, Symposium on Byzantium and the Italians, 13th-15thCenturies. 1995. pp.339-357. This page was last edited on September 26, 2014, at 19:40. This page has been accessed 91,803 times.